Amethyst is rated at 7 on the Moh's Scale of Hardness. Because of its relative hardness and having no particular warnings for care, Amethyst can be used for all jewelry purposes. 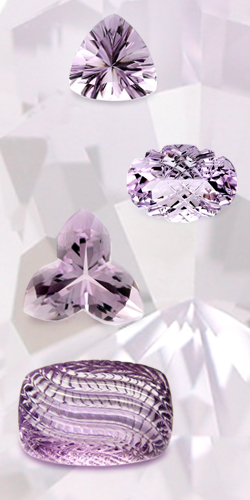 Amethyst is found in a variety of hues of purple including deep purple, light lilac, lavender and mauve. The pale lilac colors, coined Rose De France, were once considered undesirable but have recently become a popular fashion favorite due to intensive and clever marketing.Regardless of this popularity, the deep, rich purple colors are still the most sought-after.